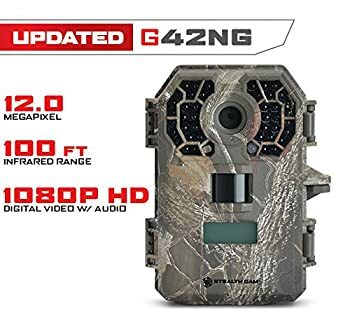 Filled with advanced technology, the ability to record in HD resolution, night vision capabilities, multi zone and motion detection sensors built right in, and with GPS stamping on every single image or video taken, there’s almost no reason to go with any other trail camera than this one. About the same size as a paperback book (and just a little bit thicker), you’re going to be able to mount this camera to pretty much anything and everything imaginable to give you the rare opportunity to record all the nature and wildlife that your camera has the opportunity to pick up in its lens. The user interface is intuitive (we’ll touch on that in just a moment), but the rugged durability of this camera really cannot be overstated. This thing feels indestructible! All of the controls on this particular solution have been simplified dramatically, while still giving the user infinite options to customize so that they’ll be able to record nature exactly as they intend to. 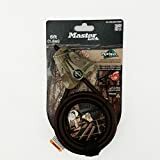 On top of that, the controls of this device can be manipulated even while wearing gloves, something that a lot of early morning or dusk outdoorsmen are going to appreciate. It’s also nice to know that you’ll be able to use this camera in the winter time without losing a digit or two to frostbite! We’re talking of course about the matrix Advanced Blur Reduction Technology built right into this amazing trail camera. This technology is going to result in the crisp best and most impressive lowlight pictures and videos taken. It’s also going to give you the opportunity to capture media even when there is no moon or stars to provide any lighting whatsoever. If you are serious about getting your hands on a quality piece of technology for next to nothing (you just can’t beat that price tag), this is something that you want to seriously consider. It seems to have some issues with contrast and saturation randomly throughout the day. It will over expose photos occasionally, however, not to the point of unrecognizable. They are bright, but not ruined. Definitely YES for a security camera! This camera has no noise and no red light when taking the picture, i.e. Stealthy. This camera is a lot easier to set-up then those security cameras. In fact we purchased a $400.00 Security camera set from Sam's Club and it was so complicated to set-up, we took it back. That is when I realized I could get just as good pictures with a game camera for a lot less money. This camera is all that it says it is! I purchased my second Stealth Cam No-Glo Trail Camera last week. That's how much I recommend this camera. The pictures are clear and in color in the daylight. At night, pictures are very clear. I highly recommend this camera, you will not be unhappy with your purchase. 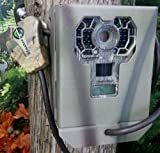 We use it as a security camera in the tree in front of our house. I also purchased the metal G-Series bear box that goes with this camera. It fits nicely in the metal bear box. You will also need to purchase a memory card with this camera. I purchased the 32 GB memory card to go with this camera. We also use it to spy on deer, fox, skunk, rabbit that frequent our back yard at night. Hope my answer helps you out on your decision! 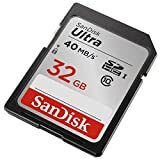 Does this camera automatically roll over when it runs out of space on the card and replace prior pictures? I haven't verified, but I was told that it does not by a rep at GSM. "Once the memory is full, it will no longer take any more images"
What is the max distance this camera will trigger? It seems the distance depends on the mass of the heat generating object, I assume if a Rino or Elephant were a hundred feet away, it would trigger the IR sensor. As a heat generating object seem to trigger the IR sensor about ten to fifteen feet away. Can you set this camera to take pictures every few seconds throughout the day?